Here is a nice introduction poster on our research group at Oxford and some of the research that we do. The Global Ecosystem Monitoring network (GEM) is an international effort to measure and understand forest ecosystem functions and traits, and how these will respond to climate change. The GEM network aims to capture both ecosystem-level properties and the functional composition of the community. The GEM network encompasses many separately-funded projects, including projects in the Amazon-Andes, in West and Central Africa, and in Malaysia. We are also looking to incorporate new partners and plots into the network, such as in Belize, Hawaii and China. The GEM team has collected extensive data on the carbon cycle of forests across the tropics . Over the period 2013-2018, the GEM-TRAIT protocol will be applied across all our GEM plots. This ambitious field campaign will result in the first global dataset linking tropical tree diversity to ecosystem function. GEM-TRAIT is funded by a European Research Council Advanced Investigator Award , with additional support for specific transects by other NERC and Royal Society grants . It will run from 2013 to 2018. 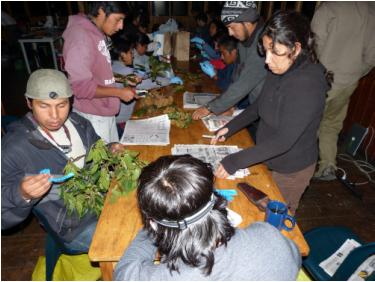 The first and probably most ambitious traits campaign, in the Peruvian Andes, kicked off in April 2013 and continued until November 2013. It has been named CHAMBASA (CHallenging Attempt to Measure Biotic Attributes along the Slope of the Andes). Chambasa is slang for "a lot of work" in Spanish. Some images from CHAMBASA can be found here, here, here and here. The second major campaign was over April-May 2014, and is focussed on the forest-savanna transition in Brazil. It has been named BACABA (Biotic Attributes at the Cerrado-Amazonia BoundAry), the name of a distinctive local palm. The third campaign (T-FORCES Peru) was in central and northern Peru in 2014, the fourth (KWAEEMMA) was in Ghana in 2014/2015, the fifth (T-FORCES Australia) in 2015, and the sixth (Borneo, as part of the SAFE/BALI project), was over late 2015. and the seventh and eighth campaigns were in the Atlantic and Amazon forests of Brazil in 2015 (the ECOFOR project). Overall we have collected a huge standardised global dataset on plant traits and ecosystem function. As part of our global network of intensive plots and plant traits collection, we are working on a gradient in Ghana ranging from wet rainforest (Ankasa National Park) through semideciduous forest (Bobiri Experimental Forest) through to forest-savanna transition (Kogyae Wildlife Reserve). Along this gradient we are studying the relationships between drought, biodiversity and ecosystem function. This work is in close collaboration with the Forestry Research Institute of Ghana (FORIG) and also the University of Tuscia in Italy. The research is funded by grants from NERC (2011-2014) and the European Research Council (ERC), and also a new grant from the Leverhulme-Royal Society Africa Programme (2014-2016), focussed on "water stress, ecosystem function and tree functional diversity in tropical African forests". The field campaign started in October 2014, and more information and photos can be found here and here. And here is a report from the Royal Society-Leverhulme Africa Awards meeting in Dar es Salaam, Tanzania in December 2014. Here is the poster on this campaign that was presented in Tanzania. The main campaign finished in April 2015, but a follow-up study by Ghanaian PhD student Teresa Peprah is looking at the seasonal variation in lead traits and photosynthesis. 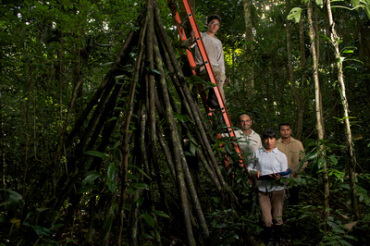 RAINFOR (the Amazon Forest Inventory Network) is a network of forest inventory work across Amazonia. We co-founded RAINFOR together with Oliver Phillips of the University of Leeds in 2001. Since then RAINFOR has led to fundamental new insights into the Amazon carbon sink and its response to drought, and the functional biogeography of Amazonia. It has been funded by the European Union, NERC and the Gordon and Betty Moore Foundation. AFRITRON is a sister network in Africa, co-ordinated by Simon Lewis of UCL/University of Leeds, obtaining similar insights for sites in Africa. We contribute sites in Ghana and Gabon (and in the future Ethiopia) to AFRITRON. T-FORCES is a project supported by the European Research Council that integrates and expand these plot networks, and also develops a similar network in SE Asia. 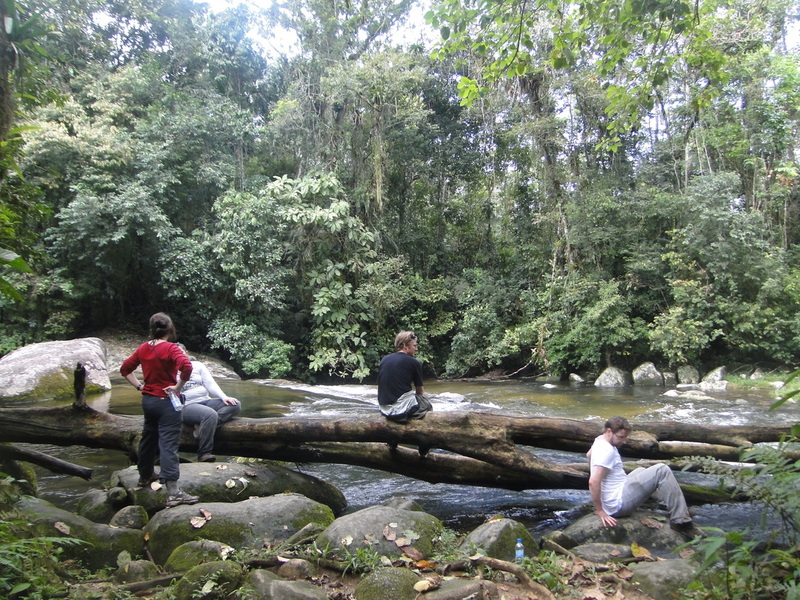 Oxford's role is to conduct ecophysiological transects along elevation gradients in Peru (2014), and Australia (2015). The Peru campaign was completed in October 2014, and more information can be found here. The Australia campaign was completed in 2015. This is a new consortium project, looking at ecosystems services, degradation and links to poverty in the cocoa farm and forest landscape around Kakum National Park, Ghana, and the coffee growing landscape of south-western Ethiopia. It is funded by the NERC/DfID programme ESPA (Ecosystem Services and Poverty Alleviation) and will run from July 2013 for three years. It is in partnership with the University of Reading, The Nature Conservation Research Centre in Ghana and Ethiopia, and numerous other partners in both African countries. The project field campaign kicked off in Ethiopia and Ghana in Feb-April 2014 and will continue for 2.5 years. A project workshop in Elmina, Ghana in October 2015 showed excellent progress, and a fascinating dataset being collected covering both natural and social science. A number of our DPhil students (Festus Asaaga, Gonzalo Griebenow, Christine Moore, Victoria Ferris) have attached additional projects to this core project. In 2016 we have been awarded an additional grant by NERC, to examine the impacts of the 2015/2016 El Niño event on both these focus social-ecological systems. Both these study areas were affected by a strong drought during the El Niño. With the new grant we will be continuing to work at this site well into 2017. The Stability of Altered Forest Ecosystems project (SAFE) explores how forest biodiversity and ecosystem function vary along a gradient from intact forests (Maliau Basin), through to logged forest, fragmented forest and oil palm plantations in Sabah, Malaysian Borneo. This is a 10-year, multi-partner project led by Imperial College. More details can be found at www.safeproject.net. Our team installed and runs the intensive monitoring plot and a flux tower measuring the impacts of conversion of forest to oil palm plantation. In association with the SAFE, the BALI project (Biodiversity and Land Use Impacts on Tropical Ecosystem Function) is a large NERC funded consortium project looking at the interactions between biodiversity and biogeochemical functioning along disturbance gradients in Borneo. It is centred on the SAFE and Maliau sites, but also includes old-growth forests at Lambir Hills (Sarawak) and restoration forest at Danum Valley. BALI involves many partners in the UK and Malaysia, and runs from 2013 to 2017. This video gives an overview of SAFE. And this blog post has some photos from our first BALI field visit, in January 2014. ECOFOR is a UK-Brazil consortium project jointly funded by NERC and FAPESP. It looks at the links between biodiversity and ecosytem function along forest disturbance gradients in Brazil, one site in the costal Atlantic Forest of the Serra do Mar in Sao Paulo state, and the second main site in the Amazon Forest near Santarem, Para. The work will involve installing intensive monitoring plots in both sites, and collected information on plant traits and also bird communities. The project is exploring the functioning and carbon dynamics of the magnificent Fitzroya forests of Chile. The magnificent southern temperate forests contain some of the oldest trees on Earth, some of them several thousand years old. The project is led by the Universidad Austral de Chile and in particular Antonio Lara, and funded by Chilean government funding agencies. We have installed weather stations and intensive monitoring plots operated by DPhil student Rocio Urrutia, and in early 2014 a flux tower will be installed. Wytham Woods is Oxford University's own long-term research site, and has played in pivotal role in the history of ecology. Our group has a range of research there. This includes an 18 ha plot where 20,000 trees are being monitored as part of the SIGEO (Smithsonian Institute Global Earth Observatory) network, lots of 1 ha plots (including in edges and fragments) that are a joint project with Earthwatch, and an eddy covariance flux tower in partnership with the Centre for Ecology and Hydrology. Here is a short video about some of our research at Wytham Woods, and some lectures on our carbon cycle work at Wytham can be found here. And this link gives an overview of the range of tree-related research currently going on at Wytham Woods (by Oxford University, the Centre for Ecology and Hydrology and the Open University and Cambridge University, among others.. This link gives a detailed report on our large 18 ha plot.